Taking a quick look through SwitchRPG’s database, you will find a great number of Role-playing games that are inspired by Japanese design (which, in turn, was founded by attempts to recreate Wizardry and Dungeons and Dragons mechanics on a video game console). Whether it be turn-based combat, character progression systems, overworld traversal, or even the more abstract and fantastic scenarios, the reason we track these games is because these traditions and mechanics are tried and true. They create satisfying gameplay loops that possess synergy with episodic storytelling and emphasize long-term investment for gradual progression. However, not every Role-playing game adheres to these traditions. This is of course evident in larger-budget releases like The Elder Scrolls and The Witcher series, though many independent developers have taken the idea of Role-playing and given it their own unique twist. Hand of Fate 2 is one such game. A sequel to the critically successful first installment that released on PC and other current-generation consoles, this game honors the traditions of the genre in a number of different ways, from its narrator detailing the events of the story from across a tableau to the dice-roll luck checks. The result is a game that requires a great deal of patience and strategy, a mixture of fast-reflex action-combat and painfully tense, slow-burning exploration and expeditions. In my time before reviewing this title, the only game that felt close to it in nature was Crimson Shroud, a title I continue to sing praises about to this day thanks to a unique combat system and dice-rolling mechanics. What this title does in order to stand out among its contemporaries, however, transforms it into something far more fleshed out, complex, and satisfying. In order to see if Hand of Fate 2 is the right game for you, it is important to detail what exactly the game does in order to create a continuously challenging, but ultimately fair system that allows for a rogue-like sense of progression mixed with long-term rewards. Read on to see whether or not this title sounds like a winning hand. Attempting to drop into Hand of Fate 2 may feel completely bewildering for a newcomer to the series as it utilizes cards in a way that might feel unfamiliar to some. Imagine each of the game’s twenty-two story-based chapters are their own unique decks of cards. The beginning and end point will always be in the same place, and depending on the “rules” of the chapter – the structure of its map or the nature of the challenge – the exclusive events, equipment, and encounters may be shuffled at random or deliberately placed at certain intervals. While this might seem very structured, as the player, you have the privilege of stacking the deck in your favor. You are given a specific amount of cards from your own stock to take in with you, though these are divided between your own event, encounter, and equipment cards that you have collected from completing chapters. Once you feel you’ve planned a good counter-strategy, your cards are mixed into the deck, and your adventure begins. Event cards are small blurbs of dialogue and flavor text, often accompanied by a luck check and possessing an unlockable element if the event is completed expertly. These cards can bestow more food, health, money, equipment, and even blessings and curses, which can be applied to the player both in and outside of combat. Encounters plunge the player into a real-time, action-based combat segments that require deft dodging and situational awareness in order to surmount. Shops and campsites stock the equipment you shuffled into the deck, and the remainder of more standard equipment is doled out at the start of the chapter. Each card is dealt facedown, creating a map that the player must traverse in order to complete and receive more packs of cards for future, more difficult scenarios. Each turn you take is the reveal of a single card, and with it, whatever consequences unfold. Many feature luck shuffles, roulette wheels, dice-checks, and pendulum-swinging extravaganzas that can either present great rewards or absolutely cripple your character, reducing your chances of completing a chapter. There are no do-overs in Hand of Fate 2 – well, actually, there are. Your choice of travel companion can grant you the ability to replay these luck-checks should your first outcome prove unfavorable, and many pieces of equipment are designed to assist the twisting of fate. With the exception of the dice-check, which has a retry option built in, I feel safe in saying that all of the luck checks are easily manipulated and actually readable enough that none feel cheap in their execution. Still, running out of HP in the middle of a chapter causes the player to lose all progress and start over, their own cards being reshuffled into the chapter deck and their placement changed. In this way, Hand of Fate 2 can be a bit frustrating – the gold and silver reward cards that feature at the end of each chapter provide some of the more valuable tools for pushing further in, and you may feel as though you’re bashing your head against a wall trying to seek out the perfect combination of cards to make a successful run. However, many acquired equipment and event cards have certain achievements attached to them, the former having options like killing a certain amount of enemies or performing a certain amount of techniques in combat before they unlock new equipment with higher stats. Meanwhile, the event cards are designed much like side quests, as the player can unlock new events by completing older ones, or use their specific challenges to bolster or counter the theme of each chapter. The saving grace of these cards is that their rewards and achievements remain unlocked even if the player fails at a chapter, which essentially creates the game’s grinding/progression cycle. Although Hand of Fate 2 is a very atmospheric game, featuring a Dealer whose ominous voice urges the player through the chapters as preparation for combat with a mysterious Usurper, its narrative sometimes takes a backseat to the gameplay. The idea that the literal card game you are playing is a tarot-esque, cosmic road map for life itself is an interesting one, and the meta-narrative of the Dealer having refined the way the game plays while also facing the challenge of a powerful foe is enticing, though only hinted at in sporadic lines doled out during gameplay. Each chapter of the game uses narrative as a framing device in order to establish the nature of the challenge at hand and give context for why those challenges exist. Navigating the wilds in search of a series of cursed relics informs the sprawling nature of the board of cards, as well as the challenge of obtaining more relics and inflicting oneself with more debuffs. The story, or at least, the lore sprinkled throughout each challenge is very tastefully done, with event cards creating a series of vignettes that flesh out recurring characters and factions more and more. This is doubly so in regards to the companion characters, who are recruited while completing chapters and have their own respective quest lines of event cards. Many of these side-quests are some of the more difficult and extended objectives and challenges in the game. Ensuring that one has the proper equipment and cards in order to tackle these narratives is just as important as completing the objective of each chapter, and provides an additional incentive in addition to fleshing out the characteristics of each companion. Outside of the unique presentation of the narrative via the Dealer, some aspects of Hand of Fate 2’s narrative may seem predictable – the warring, honor-driven northern faction at odds with the morally corrupt yet well-organized empire, or the mysterious blight turning the innocent into shambling horrors. Still, there are a surprising number of unique scenarios throughout, and the engrossing writing is bolstered by amusing character archetypes and the occasional bizarre twist, such as the oblivious farmer with an affection for potatoes. The only clashing aspect of the game is that some event cards clearly take place in certain locales, yet can be integrated into any chapter. Scrambling through a flaming town only to take an excursion into the frosty wilds in order to complete a side-quest can break the illusion somewhat, but it is forgivable when considering the developer intent and otherwise solid mechanics. Despite relying heavily on virtual cards and all sorts of board game mechanics, the combat of Hand of Fate 2 is a completely different story. When an encounter or dungeon card is drawn, players will take control of their avatar in small skirmishes or mazes. Initially, I believed this combat system was relatively simplistic, as each face button performs one of four actions- attack, block, bash, or dodge. Mashing the attack button and aiming the control stick in a specific direction will cause your avatar to lock on to the nearest foe in that direction and start wailing on them. The combat reminded me of something from the older Assassin’s Creed games, or the Arkham titles, however, this was before I learned of the various nuances revealed a few chapters in. Players can perform a quick counter attack when wielding certain weapon types, deflect projectiles, and gain access to a sub-weapon and companion command. Some enemies have blazing-fast attack animations and can perform unblockable attacks, forcing the player to roll. They also have tools that limit player mobility and buff allies, causing deeper layers of enemy prioritization. The most important aspect of this system, however, is the combo strike meter, which racks up points for every successful hit on an enemy that goes unanswered. Maintaining these streaks will unlock the special attack of a weapon, which hits for higher damage, can force statuses, and even grants a brief bit of invincibility during execution. Making sure you reach each weapon’s unique combo number is another story, however, as it will reset upon taking damage. The wealth of enemy types as well as their unique traits and attack patterns will constantly keep even the most attentive player on their toes. Because players can take damage outside of combat thanks to unfortunate event cards and the ever-present threat of hunger (oh yes, did I forget to mention the hunger mechanic? ), there is no sense of security in Hand of Fate 2. When a player creates a fantastic combination of equipment and blessings, there is always the chance that an encounter will throw them for a loop. However, some impressive setups do exist, and half of the battle is scrambling to put these cards together while wandering through a very hazardous game world. Though there are no town-like sequences where the player can freely wander, the sporadic nature of the encounter system and even less frequent appearance of dungeons (which are not extremely difficult (but always a fun diversion granting impressive rewards) makes their inclusion something to both dread and look forward towards. The game can be ruthless in pitting you against odds that far outnumber your own, though it also gives ample chance for you to find workarounds and optimal character builds. Aside from the already substantial twenty-two chapters, which in themselves offer as much content and variety as a larger-budget release, Defiant Development has included all previous downloadable content from other releases. This includes an extra partner character, as well as endless mode, a version of the game that pits your current collection of cards against an endless cycle of chapter-like tasks. Although the name of the mode might imply a lack of personality and more of a procedural nature, the number of tasks created are varied enough, with the difficulty increasing as one delves deeper, that this mode captures the feeling of the chapters well-enough and will challenge the most seasoned players. Defiant Development has promised future content updates, as well, and their previous history with pricing and the level of content found in their DLC points towards more exciting additions down the line. Although describing the action that takes place in Hand of Fate 2 is a task in itself, expressing the way the game plays and feels is a whole other challenge. Because each of the scripted story-based chapters has such a vastly different feeling, the game is constantly testing the way the player perceives it. While a number of chapters feature tighter paths with fewer branching options, others are sprawling and open, giving the task more of a board-game sort of feeling. Some chapters feature brutally difficult objectives that may require the acquisition of better gear, while others focus on throwing obstacles and new concepts that force a certain style of play. At times, it is so captivating and well-designed that it begs to be a multiplayer board game experience played alongside a friend, though the developers have gone on the record saying that co-op is not an intended feature for the game. The ability to craft decks around your preferences and attempt to squeeze in all the right cards can be a stressful, yet thought-provoking experience, which can sometimes add to the exasperation of playing through an entire challenge only to get overrun by the boss or an unfavorable encounter at the ending. However, Hand of Fate 2 is most certainly a slow-burn game, requiring revisits of earlier content and deliberate player objectives. Expecting to finish a map or obtain its highest rewards during the first play through is not a feasible mindset, and often, it takes a scouting mentality in order to first gauge the difficulty and kind of challenge found in each map before crafting a proper counter-strategy. With this being said, one of the most rewarding feelings is gathering the perfect set of equipment, blessings, and resources in order to smash through the game’s challenges – though this may not occur on the first, second, or even fifth play through. If the challenges feel too insurmountable, the player can use either earlier chapters or endless mode to grind out achievements found on certain cards – this strategy being particularly effective in handling the multiple side-quests for each companion character. As an avid fan of Magic the Gathering, Crimson Shroud, Dungeons and Dragons, and the Role-playing genre in general, stumbling upon Hand of Fate 2 was the greatest stroke of luck imaginable. The gameplay on display is some of the most unique to be found in the genre, yet it manages to implement character progression, enemy encounters, and solid narrative despite having almost nothing in common with its contemporaries. Although the game currently has a few minor bugs, I was assured by the developers that a quick patch would be underway, which solves the most pressing concern I had with the title. In spite of encountering this bug several times during my playthrough (during which the game soft-locked itself by being unable to leave a screen, requiring a restart of the game with minimal progress lost), it was not enough to deter the delight and awe I experienced while learning its systems and discovering what challenges the Dealer set forth. Because of its polish, impressive amount of content, and the pedigree of its developers, Hand of Fate 2 feels like an incredible steal at its $30 price point. Even without factoring in price, the level of quality on display here rivals other contemporary Role-playing titles while offering something extremely unique. It is because of this individuality and my own very pointed tastes that I hesitate to recommend it for everyone, however. The game is very much a methodical one that rewards the long-term player, sometimes through repeated failure, which may prove frustrating to some. 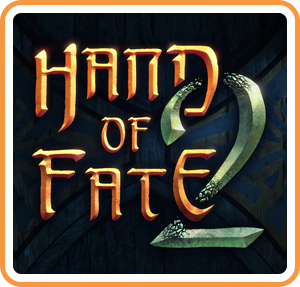 However, if you enjoy the complexity found in board or card games, or are simply an adamant fan of the Role-playing genre and wish to see a new and fascinating take on its traditions, Hand of Fate 2 has content to offer in spades. It is one of the most enjoyable and memorable Role-playing games I have been dealt in a long time, and I give it nothing more than my highest recommendation.